Successfully Added 7 Inch Car Media Player - 1 DIN, Bluetooth, Hands Free, Rear Parking Camera, AM/FM Radio, USB, SD Card Slot to your Shopping Cart. Rear parking camera for easy manouvarbility in and out of tight spots. Touch screen keypad for convenience of users. 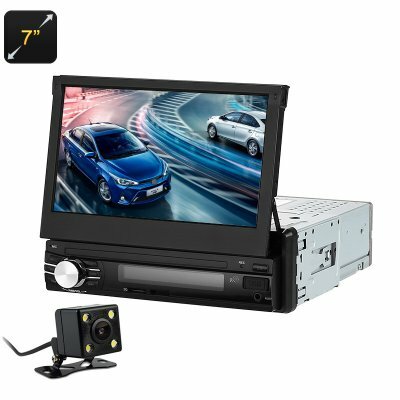 Now you can play your favorite music at any time and at anywhere with this stunning car media player. It has a 7inch large ultra HD TFT screen with 800 * 400 resolution. So you can entertain your passanges. Its touch keypad allows you to easily select the song you want to play while driving and makes interaction withoyt phone possible. Say goodbye to the hassles of wires to play music in your car as this media player supports wireless technology. You can connect your smartphone to this media player using Bluetooth and play music easily. You will also me able to sync your bluetooth phone to take calls hands free making it easier and leagle to answer call whil on the go. This feature also allows you to manage different smartphone functions such as dial a number, answer a call, stop a call, play music, view phonebook, and check call records. You can also view and modify volume control using this feature. You can download playlists of your favorite selection of music to a micro SD card or USB memory pen and listen to them through this car steroe, with support for 32GB og extra storage youll have hours of entertainment for thos long road trips. No memory card, USB or internet? You can still listen to music to kill your boredom while driving as this car media player supports AM/FM/RDS Radio. Due to this feature, you can listen to your favourit radio stations. With car media player, you have a number music adjustment features such as EQ: Bass, Treble, Balance, and Fade. Furthermore, you can also select a sound equalizer of your choice as well from flat voice custom rock pop jazz classicoptions. This car stereo comes with a 12 months warranty. Brought to you by the leader in electronic devices as well as wholesale car radios and gadgets..